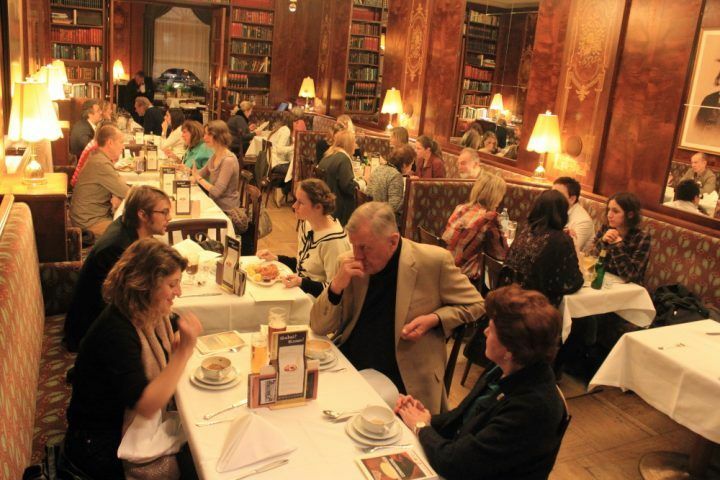 At Vienna Coffeehouse Conversations, strangers sit down to eat or drink together, with a menu of questions to ask each other. The questions lead to stories among participants, and the evening is an adventure in storytelling. We want to revive the spirit of debate that existed in the coffeehouses 100 years ago. The events are in English to allow people from all over the world to take part. After a brief introduction from us at space and place, you meet someone and enjoy fine Viennese food in a relaxed atmosphere. Questions range from ‚How important is money to you?‘, to ‚Which part of your life was a waste of time?‘. They are easy to understand, but difficult to answer. Previous dinners have led to weeks of email exchanges, where the pair continued to discuss the ideas presented. Other questions explore travel, friendship, work and inspiration. Our aim is to sit down visitors with locals, one to one. For us, visitors – or outsiders – include musicians, conference attendees, resident diplomats and cultural travellers. Look at the Tischgespraeche page on our site to learn more about the concept of a conversation meal, which we first staged in April 2012 (in German). The Vienna Coffeehouse Conversations build on Oxford University professor Theodore Zeldin’s Conversation Meals, which have taken place as part of street festivals, in art galleries from London to Singapore, and at the World Economic Forum in Davos. The Café Ministerium is a plush local favourite just off Vienna’s Ringstrasse. Voted the most popular coffeehouse in the city centre in 2013, civil servants from the surrounding ministries love to lunch there on red velvety seats and marble tables. The Ministerium also serves as the ‚extended living room‘ for a few regulars‘ tables and club meetings. The café is a 10-minute walk from Stephansdom through the historic centre. It is located just up the road from the Museum for Applied Arts (MAK). You can choose what to eat or drink on the evening. Cost: €11. Please bring cash, since the cafe does not accept cards. Couples and small groups are welcome. This idea can be adapted for birthdays, conferences or office parties. Please call Eugene for more details: +43 680 1254354.